Healthy again after a season of injuries, the Seahawks return to their usual perch atop the NFL’s weakest division. T.J. Houshmandzadeh is the best receiver Matt Hasselbeck has ever had in Seattle, and Edgerrin James is still a good enough running back to keep teams honest. I don’t think the Seahawks are a great team, or even a very good one. They’re decent, and decent has been enough in this division for a long time. Tim’s favorite player in Seattle Seahawk history is…: Dave Krieg beats out the man he always threw the ball to, Steve Largent. You didn’t pick Largent? I know; that would have been too easy. A Great and Recent Seahawk Game: This was already a pretty wild Wild Card Game, and then came the end. That’s just another gratuitous shot at the Cowboys: True, but what did you want me to pick? That “classic” NFC Championship against the Panthers? That’s right! The Seahawks went to the Super Bowl! I had this exact conversation with my brother the other day. The Seahawks actually went to the Super Bowl. Remember when Matt Hasselbeck made that bold coin toss prediction in Green Bay? Who could forget? In a division that’s become tougher and tougher, it’s about time the Saints justified their 2006 breakthrough. Drew Brees is still the best quarterback in the NFC by a wide margin, he has a ton of weapons in the receiving corps, and Reggie Bush and Pierre Thomas are an excellent running back duo. Offense hasn’t been the concern in New Orleans for some time, though. The defense, however, should be good enough—and by that, I mean, just slightly worse than the league average—to allow the Saints to consistently outscore teams. Is Brees the greatest quarterback in Saint history? I’d be interesting in seeing how New Orleans fans rated him next to Archie Manning. I think Brees beats the infamous Billy Joe Tolliver and even Bobby Hebert. Tim’s favorite player in New Orleans Saint history is…: One of my favorite nicknames of all-time belongs to the late Craig “Ironhead” Heyward. Of the Zest commercials? Oh yeah, of the Zest commercials. A Great and Recent Saint Game: What the Mike Piazza home run was to New York, the Steve Gleason blocked punt was to New Orleans. What about the lateral game? That was great too. Until, you know, they lost. If the Saints were a Star Wars location, they would be: Cloud City. Everything’s a little bit different there, and if Sean Payton wants to get to the big game, he’s going to have to sell a part of his offense-only soul Lando Calrissian style to get there. Did you know? The Saints have two playoff wins in their history. I’ve vacillated a lot on the Packers already this season, initially having them at 11-5 then down at 7-9 and now splitting the difference. I think Aaron Rodgers is a good quarterback but not the great one many people expect him to be, and the offense will be above-average again. It basically comes down to whether the defense, behind new coordinator Dom Capers, can return to the form it had in 2007 when Green Bay made it to the NFC Championship. If Capers can pull it off, the Pack have as good a chance as anybody in this wide-open division and conference. Tim’s favorite player in Green Bay Packer history is…: You can make a case that Sterling Sharpe had the best name in NFL history. I mean, both his first and last name are adjectives that describe him. Are the Sharpe brothers the greatest receiving duo in NFL history? Umm, sure? A Great and Recent Packer Game: The game that made Brett Favre: his first playoff win at the Pontiac Silverdome against the Lions. Can you give us one without Favre? No. Was that the loss that killed the Lions? No, this was the loss that killed the Lions. If the Packers were a Nintendo video game, they would be: Super Mario 2. While the original Super Mario and Super Mario 3 get all the pub, Super Mario 2 was totally off-the-wall, creative, and very fun to play. This won’t be a traditional Packer team, but it might all work out in the end anyway. Did you know? The Packers had never lost a playoff game at Lambeau Field until 2002. They have lost three of their last five since. 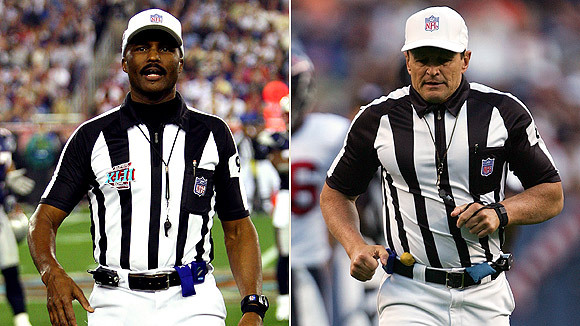 I’ve always been disproportionately proud of my ability to discern all NFL referees by both sight and voice. It’s a talent developed over years of watching myriad NFL games and unnecessary research on Wikipedia. The fruit of my toiling is here for you now, a completely personalized and very arbitrary ranking of the NFL referees. Ron Winter is a ref who doesn’t play by the rules, and that’s really the problem. Winter, who seems like a nice guy who just doesn’t give a crap, captained the biggest officiating debacle of the decade in the 2002 Wild Card game between the Giants and 49ers, so suffice to say we’re not on good terms. Plus, I used to get him confused with former ref Ron Blum, who was also not very good. I have no idea who this guy is, which means he’s never reffed an important game. I’m pretty sure one of the first things you learn at Referee College is not to blind one of the players. Triplette also didn’t have the guts to call this a safety.